Elie Wiesel, Nobel Peace Prize winner and survivor of Nazi concentration camps at Auschwitz and Buchenwald, recently published a new translation of his very first book, Night, originally issued in 1958. The new translation from the original French edition is provided by his wife, Marion. Wiesel has written over forty books. He claims this first one is the most essential. Night tells the story of Wiesel's experience as a 15-year-old boy in the horror camps of death where he lost his family, his innocence and his orthodox Jewish faith. I am walking through the short volume right now. It is tough reading, but powerful and gripping. In one terrible passage Wiesel describes his reaction to witnessing the hanging of a young boy who had the face of a "sad angel." As the crowd watched his death, someone behind the young Wiesel groaned, "For God's sake, where is God?" "And from within me, I heard a voice answer: Where He is? This is where--hanging from this gallows." In a recent interview with Time magazine, Wiesel pondered what would be required to redirect humanity away from violence and self-destruction. "We should fight hatred. There should be a Biblical commandment: Thou shalt not hate. And there is indifference. Everyone can fall into this trap. It's so easy to enter into indifference and stay there. An indifferent person remains indifferent unless shaken up. These are the most important subjects in the world." I believe he is onto something here. How about you? Removing hate from our hearts and our neighborhoods and our cities--talk about changing things from the inside out! Each of us can go to work on this goal today, can't we? Right inside where we live and decide the issues of life. Wiping out indifference? Equally important as we renew our individual and collective commitment to building healthy and functional communities for everyone. Both objectives call on me to open my heart to others, to adopt humility as a way of life and, simply put, to never give up. In explaining his own hope in the face of the horrific power of evil in the world, Wiesel quoted Albert Camus who once wrote, "Where there is no hope, one must invent hope." Wiesel's wisdom and commitment to never allowing us to forget the truth of his own terrible past, propels us to embrace a new hope even in the face of the most daunting of urban challenges associated with entrenched poverty and injustice. Pick up a copy of Night. You will be moved deeply. Not long ago my oldest daughter, Jennifer Toombs, sent me the following quote from Robert Kennedy, Jr.
"People are disillusioned with religion today. So many wicked things have been done in the name of religion - - in the name of the Bible. People can justify anything using the Bible. If all of the sudden the Bible becomes your God, rather than God being your God, it's the same thing as money being your god or whatever it is. It's gonna corrupt your spirituality. And it can be used by people to dominate other people." Jennifer sees what lots of people are coming to realize. And, ironically, the Bible can be complicit in the spread of the death. So, how can you tell when the Bible is being misused in a potentially deadly manner? This seems to me to be an important question for people who live and work in urban settings today. Try this list as a beginning. It could be that the Bible is being misused. . .
. . .when you hear it quoted to personally attack individuals or groups of people. . . .when folks tell you how current events are in fact clear evidence of God's judgment. . . .when various, unrelated passages are connected to predict coming events with certainty. . . .when people are excluded or considered "second class." . . .when we turn to it for the creation and promotion of single-issue social agendas. . . .when. after reading it, I always feel right and judge others to be obviously a bit off center. . . .when ancient, obscure, oblique texts are considered on a par with clear principles such as the Golden Rule. . . .when my religion and religious tradition comes off as obviously better and more correct than yours. . . .when hatred is justified. . . .when I feel that I can forgo kindness. . . .when I feel superior to anyone. . . .when I can choose not to see, embrace or attempt to relieve the pain of another human being. . . .when, after reading it for years, I do not understand the central importance of caring for the weak, the marginalized, the poor and the oppressed. . . .when I cannot find a way to matter in this here-and-now world for all of my concern about the next life. . . .when any part of it "trumps" the life,words and work Jesus. Maybe you have your own list. I missed the reunion this year. It was our last one. Twenty Februarys ago, a group of around 20 eager young ministers gathered at the invitation of a couple of older mentors to talk about preaching. Because we chose to get honest with each other, we ended up creating an amazing support system that has endured for two decades. I hate it that I missed the last gathering. My life has changed so much since the first meeting of that special group of men. More on that later. Over the years we found that we could count on each other no matter what. That sort of friendship, shared with such a large group, is really amazing. Divorce, death, grave illness, marriage, loss of employment, changes in careers and positions, new denominations, restructuring of faith and worldview, stress, success, joy, endurance. . .I could go on and on. Life is better when you are part of a group. We created community that first year. We worked at maintaining it. We let each other down from time to time. But we always knew that we were a part of something very unusual and sustaining. When needed, we held each other accountable. Yet, we didn't judge one another. Smaller, sub-groups within the larger whole became very close and lots of great things were accomplished as a result. It is the way of community. In the beginning I know our egos were a bit inflated. We operated under the silly illusion that being asked to be part of the group made us something special. What we soon discovered was the fact that we were just ordinary guys with predictable issues, opportunities, struggles and needs. We helped each other out. As the years played out, we came to realize that our group, as currently organized, had served its purpose. Toward the end it became harder and harder for everyone to make the reunions. I know that was true for me. My current work and life don't leave much room for extras or optional events. Over the past several years scheduling conflicts could not be managed or overcome. I missed a number of the gatherings. But, I did not forget the group. And, I had lots of evidence that the guys did not forget me. Last year--a year when another Dallas group member and I hosted the group meeting--thanks to some good leadership and honest communication, we decided to mark an ending to our formal group. The last gathering took place on Thursday and Friday last week. When missions are accomplished or when life changes over time, relationships and groups need to change as well. Rather than be sad or nostalgic, I can't help but smile at my buddies and so many of our memories. Like the time a Harley Davidson, Hell's Angels group offered to intervene on behalf of one of our members with his church board! I will miss seeing my friends, but I know they will all be there for me and one another, should need arise, because of all that we discovered together. Thanks, guys. . .er, Bucks! It was a great, great run! Yesterday, in a bit over 6 hours, approximately 200 volunteers from PepsiCo, Frito-Lay, KaBoom!, the Dallas Housing Authority and the Monarch/Carroll/Roseland neighborhood combined their energy, hard work and creativity to turn a vacant lot into an amazing playground for children! I have never experienced anything like it in my life! At 8:00 a.m. there was cleared ground, complete with a few holes dug for the placement of playground equipment--thanks to our advance preparation crew. By 2:00 p.m. we all enjoyed a grand opening, ribbon cutting ceremony for our new playground! The entire experience served as an icon of what happens when communities enjoy the benefit of resources and opportunities. The key factors were so obvious. First, we had what we needed to do the work--capital, property, materials, labor and will. Second, everyone played their part. This was no outside-in project. The community owned it, helped build it and took advantage of the willingness of outsiders to be involved as partners and suppliers. Third, without our realizing it, our work erased our differences. The normal lines that keep us apart were nowhere to be seen on this special day. Race, class, employment, education--you name it--nothing mattered but the community, the children and our agreed upon work. At the end of the day, we were tired, we were proud and we wanted to celebrate! Community does that to a person and to a neighborhood. Two incidents from my day stand out. During our opening ceremonies, a young mother who lives next door to the new playground began crying. I asked her if she was okay. She replied, "I'm so glad today! I just can't believe our children are going to have something this nice to play on. I'm so ready to see our community get better." Her comments provided me motivation toward the end of the day when my back was getting tired! Then, as we were preparing to leave, a volunteer I'd been working with on the concrete crew came by to slap me on the back, shake my hand and tell me, "Take care, Larry!" We had been perfect strangers. He lived far from our neighborhood. But in our work we had found significant common ground. I know stories like this unfolded all day among all of us. If you are in Dallas, drive by 2011 California Drive and take a look at our handiwork. You'll like it, I know. Today our neighborhood is building a playground for its children. . .all in just one day! Well, I guess that's not quite true. A number of volunteers, including Central Dallas Ministries staff led by our amazing Chief Operations Officer, Keith Ackerman, have been busy doing "prep work" for the past three days. But, today well over 100 volunteers from the Carroll and Monarch community, located just down the street from our first new housing development at Ashby Commons, will gather to assemble and install a complete playground in cooperation with KaBoom!--the renowned community organizing, playground builders. In addition to our neighbors there will be volunteers from our partners in this project--PepsiCo, Frito-Lay, the Dallas Housing Authority as well as a team from Radio One! Our celebrity for the day will be Dallas Cowboys future Hall of Fame inductee, Deion Sanders. The community will be stronger for it and our children will have wonderful new place to play outdoors. Yesterday turned out to be fairly amazing. Our team met at City Hall with representatives from the City Manager's office and other program leaders to provide a briefing on our proposed affordable housing project in downtown Dallas. It is fun to watch city staff people get creative in an attempt to help make a project successful. Our goal is to develop over 200 high-quality, affordable housing units in a previously abandoned 15-story building. If we are successful, the project will be a model for the city. We have a ways to go for sure. But we are making great progress. I can see previously homeless persons calling our building "home." It will be magic for us all. Every one of our venues have been packed with people this week. It is amazing how the intersection of need and opportunity attract, sustain and connect people. I notice that folks tend to find reasons to just hang around our gathering places even after their official business is completed. It is a good sign and fun to watch, even though the growing need is tragic. Yesterday during lunch time, I spoke to a small group of very bright medical students at the University of North Texas' College of Osteopathic Medicine in Fort Worth. They are so bright, focused and generally wide-eyed to their ever expanding world of learning and work, at least the ones who ask me to speak fit such a description. After every meeting like the one I enjoyed yesterday, I come away feeling so encouraged about the level of care that will be available in the coming years. I am also impressed with the social conscience of the students with whom I meet. Again this may be a function of the groups who invite me to meet with them. Whatever the case, these young people (forgive me, I almost said "kids") care about justice, compassion and equity when it comes to their chosen field of work. It is clear these young doctors aren't on their chosen path primarily for the money. They want to be healers and they want to see healing extended to everyone in as equal a fashion as possible. They worry about health care and health outcomes disparities. They are concerned to live sound, just lives. They want their medical practices to be built and conducted with these values in full view. They are wide open to a single-payer, national health care plan because they understand that extending better health to more Americans, even to all Americans, benefits everyone. They aren't phased by lobbyists. They want to see the nation do what is right by its weakest and poorest citizens. They also see that doing what is right for more people also makes good sense economically in our exploding, never-to-go-back, one-world economy. I keep hoping that these young doctors will step up, take the wheel and guide our nation into a better way of doing health promotion, health care and disease control for everyone, regardless of income levels or ability to pay. I'll confess, I'm trying to encourage every last one of them to become agitators! "Those who profess to favor freedom and yet depreciate agitation, are people who want crops without plowing the ground; they want rain without thunder and lightning; they want the ocean without the roar of its many waters. The struggle may be a moral one, or it may be a physical one, or it may be both. But it must be a struggle. Power concedes nothing without a demand; it never has and it never will." The past two days I have been in Abilene, Texas. I was involved in the annual lectureship program at Abilene Christian University and made a presentation yesterday dealing with poverty, compassion, justice and faith. The "jumping off" place for my speech was Hurricane Katrina, New Orleans and the national response to the tragic storm. After I spoke, there was a time for questions and discussion. It turned out to be quite lively. One young minister from the Dallas-Fort Worth area stood out. He described all that his church was attempting to do among working, low-income families who came to his church again and again for assistance. "The people we are serving out of our food pantry come to us time after time--the same people," he explained. "Our volunteers are asking me, 'Why do these people keep coming back? They use us as a grocery store.'" he continued. "We are paying lots of utility bills and providing rental assistance to many families," he went on. "We are asking ourselves if we are really doing anyone any good," he said. As he expressed his concerns, a couple of things became clear to me. First, this church regarded its ministry to the poor as primarily a compassion ministry to be utilized in acute situations. The church's food, assistance funds and benevolence was there for people in times of emergency. What this church discovered in the community was something far different than acute or emergency needs. The needs of this community were chronic and deepening. I tried to encourage my friend to reframe the effort for his church. Possibly regarding their food pantry as an alternative community grocery store was not such a bad idea. Working people in his neighborhood simply don't earn enough to make ends meet. Their need is chronic and it is not going away anytime soon. The church's ministry is likely to be literally holding families together and keeping them off the streets. Second, and more troubling, this church cannot continue at its current pace. The need is too great. As the minister said at one point in great frustration, "A church could easily go broke like this!" Of course, he is correct. The situation facing this fine young minister and his church is very, very instructive. As federal and state lawmakers and executives continue to cut funding from the budgets of programs designed to serve and to lift the poor, they often tell us that the work they are eliminating from public obligation should be done by the church. Such expectations are naive at best and based on a cruel and knowing deception at worst. The fact is, the church cannot bear the burden of the poor in America alone. The church has an important role to play. The church could and should do more. But, the scale of the problem is far too large for the church. The vast majority of churches today are not equipped to handle the need in terms of volume or complexity. It is simply not true to continue to say that the plight of the poor in America can be managed by the church without the involvement of public, government institutions. It is just not true. And, promoting this deception helps no one. We track outcomes and units of service very carefully here at Central Dallas Ministries. There are a number of reasons why we take the time and the care to do so. Funders want to know what we are up to and what we are actually accomplishing. More importantly, we want to know what happens month-by-month. We want to study the community, its responses and its demands. By tracking our activities and efforts we gain valuable community intelligence beyond the specifics of our various endeavors. As a result of this commitment as an organization, I receive a steady stream of periodic reports on all that we do. Recently, a report on our Community Health Services crossed my desk. As I reviewed it, I have to say I was amazed. A year ago in January 2005, we "hosted" 1085 patient visits, including 555 general medical visits, 61 diabetic patients, and 28 pastoral counseling sessions. This year in January those numbers had all grown significantly. We provided a welcoming medical home for 1541 patient appointments (up 42% from last year). Of these visits, 970 fell in the general medicine category (up 75%), 91 involved diabetic patients (up 49%)and 45 came for pastoral counseling (up 61%). Clearly, the need of the community is not declining. None of our patients enjoy the benefits of medical insurance. Almost all either work or come from working families in the case of our children. Recently, while providing a group of interested guests a tour of the CDM landscape, we dropped in on the clinic operation. People were everywhere--standing outside, three deep down the hallways, seated on the staircase, crammed into the waiting room. We are working on plans to relocate the clinic to a larger building, possibly into our headquarters building on Haskell. We will figure it out. The point here is clear: the need grows and grows. At the same time, community resources continue to shrink. Our growth amazes me, but it is sad growth indeed. Malcolm Gladwell, author of The Tipping Point and, more recently, Blink, published a provocative essay in this issue, "Million Dollar Murray." Gladwell argues that with many, if not most, seemingly intractable social problems, we fail because we look at them in far too "normal" ways. Our intuitions teach us to look at and to plot most human realities and tendencies with the aid of a Bell Curve mentality. In this essay he uses homelessness, police brutality and pollution as examples of human challenges where the Bell Curve approach is not only incorrect factually, it simply does not work. The essence of his argument is very simple: concentrate resources at the point of real pathology rather than spreading resources equally across an entire community, problem or continuum. Gladwell makes a strong case that much of our failure in addressing truly vexing issues is less about public policy and more about public compliance. I needed to hear this and I need to spend more time thinking about it. In the cases he cites as proof of the truth of his paradigm, he demonstrates that by investing considerable resources and effort in the real "hot spots" of an issue or concern, progress can be made and efficiencies achieved. Regarding homelessness, he builds a compelling case for providing permanent housing--apartments for chronically homeless persons--complete with intensive case management and guiding services and engagement. The results with such an approach can be startling. Chronic homelessness could be largely removed from our urban areas if we were willing to think in this new manner. I'd love to hear your thoughts once you have digested his ideas! Last Thursday, John Greenan, Executive Director of the Central Dallas Community Development Corporation and one of our lawyers at our LAW Center, and I flew to a city in another state to consult with the leaders of a church. This particular church has a storied past in its denomination. Thirty years ago its membership had grown to almost 2,000. Its minister and leaders had a vision and an ambition to build a giant, megachurch on the almost 40 acre tract of land that the congregation owned. They built a sanctuary that could seat 3,000. An educational complex was designed to accommodate the growing congregation. But somehow things just didn't work out as planned. Today the church numbers under 700 members. It finds itself strapped with a lingering, paralyzing debt to service monthly. Fixed costs often exceed revenue generated by the weekly offerings. The leaders of this church are eager to reach out, to serve the community, to make a difference. But their financial realities block them at every turn. As we spent the day with these really fine folks, both John and me could literally feel the burden and the depression of the group. What could be done to provide some relief to the church and at the same time assist it in regaining its legs for mission? As we learned about the community surrounding the congregation's building, a new vision began to emerge. The church currently owns 32 acres of the original tract of property. On one side of the building sits a beautiful 6-acre tract of carefully mowed Bermuda grass. We learned that 42% of the homes in the four census tracts surrounding the church are occupied by working families who rent. What if the church created a non-profit arm to do community development? What if this new community development corporation (CDC) developed a planned community of say, 120 new townhomes with first time home buyers in mind? Further, what if their CDC provided homeowners' education as an outreach strategy? What if 10-15% of the new townhomes were sold to church members who fit this same profile and who were willing to purchase one and live in the new community intentionally? Success in this endeavor would mean at least two things. First, most, if not all, of the debt could be eliminated by the profits earned from home sales by the CDC. Second, a viable outreach to area families would open to the church immediately. With current members living in the new neighborhood, all sorts of possibilities seemed evident. On the other side of the building was another tract of undeveloped land, partially devoted to a gigantic parking lot that was seldom more than 1/3 full. What if the church's CDC applied for U. S. Department of Housing and Urban Development (HUD) funds to develop senior housing on this part of its campus? In addition to providing much-needed, quality housing for senior adults, after generating income for a specified period of time, the building would become property of the CDC. Again, multiple results that serve the church well. Seniors could be "adopted" and cared for by the church, including some of its own present members. The strategy would provide more funds for the CDC to continue its work with the church while further relieving the church's debt and fixed costs load. Finally, we suggested that the church "deed" its property to the new non-profit and then rent back only what it currently needed to conduct its business. The CDC would then have the task of retiring the remaining debt while raising funds to immediately service the monthly debt expense, freeing up weekly offerings for church activities and outreach. One obvious business opportunity, thanks to the size of the building, appears to be convention and meeting services that would utilize the entire building for outside groups needing space and catering services. The church enjoys the presence of a large, fully outfitted commercial kitchen. The building could actually become a very important "profit center," as opposed to its current "loss center" with "albatros about the neck" status! As the day ended, the energy had returned to our new friends! The key was the group's willingness to think outside the box of traditional church approaches. The prospect of harnessing market forces with clearly defined assets on hand, opened a new vision of opportunity to a faith community that is needed in its city. However, new thinking will be critical for most. Once each month, for several years now, Central Dallas Ministries has participated in a program offered to Dallas by the North Texas Food Bank. The Commodity Supplemental Food Program (CSFP), an effort of the United States Department of Agriculture, provides nutrient-rich foods to low-income persons on a monthly basis. Organizations like CDM serve as distribution centers. Each month our great staff and faithful community volunteers have been providing fruits and vegetables, juices, meats, fish, peanut butter, cereals and grain products, cheese and other dairy products to low-income persons through this wonderful program. At CDM all of the beneficiaries of these supplemental foods are elderly persons. Nationwide 90% of those served in this program are senior citizens. You should be here on this special day each month. The atmosphere is part carnival, part social event, part church fellowship! The wonderful older folks who show up are so grateful for the food. They are also glad to see each other and our team. CSFP is one of the smartest, cleanest, most economical programs available. But, during FY2006, the program will be severely cut back--59,000 people will be dropped. In Dallas, 700 elderly residents will no longer be allowed to receive this benefit. If Congress approves the President's budget for FY2007, the entire program will be eliminated to cut spending costs, again, to find funds to help underwrite more tax cuts for our wealthiest citizens. Translation: over 459,000 seniors from across the nation will no longer receive the monthly food supplement, over 7,000 here in Dallas. A recent survey of current participants revealed that more than 50% of seniors who live alone reported monthly income of less than $750. In senior households of two, more than half reported monthly income of less than $1,000 per month. When asked about plans to cut this community-based, highly efficient program, the Dallas Congressional office of U. S. Representative Jeb Hensarling (R-TX) responded by saying that these seniors could "sign up for Food Stamps." Oh, sure. Transportation, paperwork, pride. . .only a partial list of the roadblocks for seniors seeking the meager Food Stamp benefit. Clearly, Mr. Hensarling knows very little, if anything, about poverty as a crushing fact of life. But then, that's why we have this problem, isn't it? Earlier this week I sat in another meeting during which I listened to more statistical confirmation of the sad, horrible, distressing facts that surround poverty as it relates to health outcomes. The particular research tool that provided these new insights plotted several health outcomes and used 10 variables to analyze conditions in Dallas census tracts. Census tracts were scored and ranked from best to worst along these variables. What was intriguing, but not surprising, was the fact that in the worst neighborhoods in Dallas, as judged by these criteria, the index of "relative well being" was worst. Age adjusted death rates from cardiovascular disease were highest. The same applied to the death rate from stroke. Poverty is killing millions of our fellow citizens and it does so in ways and by means that are extremely preventable. The Dallas Business Journal recently reported that almost 36,000 millionaires call Dallas, Texas home (January 20, 2006). By 2010 that number will swell to nearly 60,000. The number of millionaires will grow at a 65% clip over the next five years. Only Atlanta will have a faster rate of growth among this mega-rich class of Americans. The article goes on to describe the challenges facing wealthy Dallasites in preparing their heirs for wealth. Financial managers work hard to develop investment products and training to assist wealthy entrepreneurs in just how to pass the wealth along without destroying their children. The essay is more than worth reading. One of the ways the super-wealthy can prepare for passing the financial torch is to remember the poor. Establishing family foundations, naming competent non-profit organizations that are located close to communities of need in wills and being creative about estate planning and the use of insurance vehicles can insure that the wealth will continue to work after life ends for the financially successful. At the same time, such steps can protect the children of the wealthy from the pitfalls of wealth without work, risk or effort. The parable Jesus once told about the rich man who tore down his barns to build bigger barns instead of placing his surplus in the empty barns of his poorer neighbors comes to mind just here (Luke 12:13-34). Low-income communities cannot rebound or grow to health without money, opportunity or economic advancement. The rich of Dallas and other urban areas can make a real difference by simply managing their wealth and their amazing estates with intelligence, faithfulness and creativity while never forgetting the poor. My good friend, Eddie Sanchez, Pastor of the Ross Avenue Baptist Church here in East Dallas sent this little parable my way this week. The message here applies in all sorts of ways to life. It is particularly applicable when it comes to urban communities and the rich and the poor. That very night a sound was heard throughout the house -- like the sound of a mousetrap catching its prey. The farmer's wife rushed to see what was caught. In the darkness, she did not see it was a venomous snake whose tail the trap had caught. The snake bit the farmer's wife. The farmer rushed her to the hospital, and she returned home with a fever. Everyone knows you treat a fever with fresh chicken soup, so the farmer took his hatchet to the farm yard for the soup's main ingredient. So, the next time you hear someone is facing a problem and think it doesn't concern you, remember -- when one of us is threatened, we are all at risk. We are all involved in this journey called life. We must keep an eye out for one another and make an extra effort to encourage one another. Central Dallas Ministries will host our 11th Annual Urban Ministries Prayer Event on Tuesday, April 18, 2006. The event begins at 7:15 a.m. in the Chantilly Ballroom of the Hilton Anatole Hotel on Stemmons Freeway. 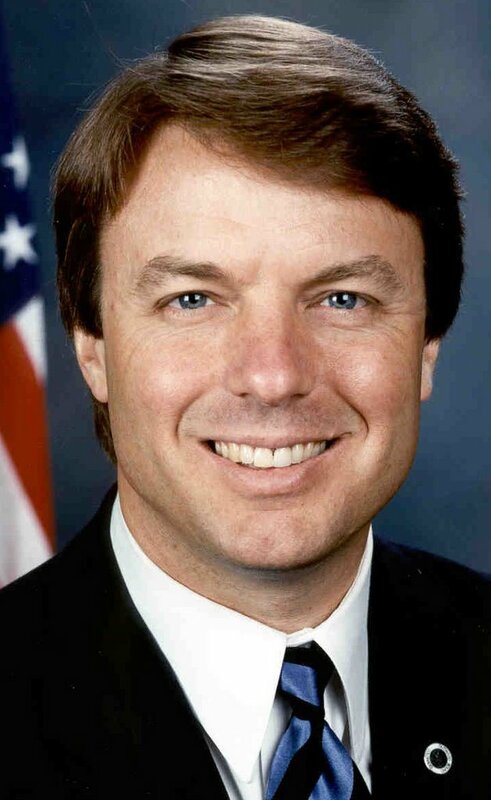 Our speaker this year will be former Senator John Edwards of North Carolina. Currently, Edwards serves as Director of the Center on Poverty, Work and Opportunity, an initiative of the University of North Carolina School of Law. The Center is definitely worth a visit to its website at: http://www.law.unc.edu/Centers/details.aspx?ID=425&Q=3. Needless to say, everyone here at CDM is excited to be able to host Senator Edwards during his trip to Dallas. Edwards has distinguished himself as one of the few consistent, credible voices raising questions, offering solutions and challenging the nation to not forget our fellow citizens who battle poverty. The former Senator, and Vice-Presidential candidate in the 2004 election, is motivated to speak to the issues of poverty and equal opportunity by his own faith and personal values. His speech promises to be unforgettable and challenging. Spread the word about our event! And, of course, plan on joining us for this very special morning! More details will follow in the weeks ahead. Our world and its cities are extremely and increasingly violent. Have you noticed: much of the death, destruction and division follows almost gleefully in the wake of one religion or the other, including mine and including yours. I've been wondering. What if all religion and every "important" question associated with religion and the theologies of the various religions were done away with except for one? What if God and God's will were reduced to one single directive, just one? No more arguments about tradition, sacraments, pilgrimages, holy shrines, doctrines, preferences, historical disputes, etc., etc., etc. No more war defined by "faith." No more using God or "God's values" as a justification for conflict, division and death. What if, horrors of horrors, God doesn't need our unction about all of this holy stuff? What if it really is much, much, much simpler than any of us every imagined? What if God's religious expectation of us actually boils down to one very important concern: people. Maybe we can begin by listening to our various leaders, the ones behind the expressions of different religions and philosophies of religion. A city, dare I say a world, filled with people who accept this as the essence of their faith and religion would be an incredible place to call home, don't you think? Time out for a word of clear and unqualified praise for public school teachers in America, especially those who attempt to instruct in urban areas like Dallas. Teachers don't get a fair shake in our society. And frankly, I've had enough of it. For the sake of full disclosure I need to say that both of my daughters are public school teachers. But I would be writing this if they were truck drivers or lawyers! Before the last school board election here in Dallas, a bright young candidate dropped in to visit and to get my perspective on the public schools. "What is the biggest challenge facing our schools?" he asked. "That is a simple one," I remember replying. "Poverty" was my one-word answer. The look on his face was incredulous. "Yes, poverty is a problem, no doubt," he said, "but what about education? I mean the school system can't fix poverty!" I went on to tell him that, while I agreed that the schools can't "fix" poverty singlehandedly, until school districts and communities faced the realities of poverty, public education would remain locked up in a frustrating, organizational stall. When children live in poverty, especially the deep, generational variety, learning and instruction are nearly impossible. When our little ones arrive at school hungry, sleepy, emotionally troubled, and generally stressed to their limits, very little learning is possible. Teachers can't be blamed for poor student performance given these conditions. I know not all teachers are up to speed in talent, education or motivation. This has always been true of a few teachers. But, teachers aren't our problem. Social and community reality--these are our problems. Tack on parental irresponsibility, the absence of any expectation of discipline or rigor, parental abandonment, the crumbling nature of the American family and overloaded, bureaucratic administrative drag in education leadership at every level, and your begin to round out the picture facing our teachers and their students every morning. Poverty exacerbates each of these other social challenges. Teaching to a standardized test will not get the job done. If we really and truly want to see our children achieve again, a comprehensive, holistic approach is required. That will mean a national campaign to reduce poverty and to limit its current, pervasive impact on our children. Included must be adequate funding for decent housing, accessible health and dental care for everyone, employment skill improvement, parental support, mental health services, livable wages, code enforcement, economic development and education, both public and secondary. Those charged with school administration must be willing to go back to a zero-based evaluation of every decision to make sure that students are on the receiving end of every strategy, tactic and resource allocated and expended. What we need is a community commitment to our children and to their families. Everyone must step up--churches, synagogues, mosques, temples; city, county, state and federal public funds; individual, corporate, foundation philanthropy; and a concerted, national media and public relations campaign that will not allow us to forget. Everyone must expect more. That means all of us must challenge elected officials to care, really care. If they don't, then we need to act to find and to elect those who do as replacements. Until we get on with this or something mighty near like it, let's commit to give our teachers a break! Unless you've been there, you don't have a clue how demanding and impossible their jobs can be. If you work hard and long, but don't earn much, you and your family will live on the edge in constant jeopardy of economic, social, emotional and relational collapse. Millions of our fellow citizens in this nation know this because they live it daily. Our Resource Center located on Haskell Avenue in inner city East Dallas serves thousands of individuals and families every month. Hundreds of low-income volunteers run the show. These special friends of mine show up five days a week to lend a helping hand to their neighbors. The center moves about 20,000 pounds of food each week through the distribution process. It is an amazing community gathering place. It is a place of solidarity, love and determined hope. It is also a very sad place. This fact is disgraceful beyond words. Yesterday I received a report from Terry Beer, Resource Center Director. In January 2006, the center served 558 more individuals and 384 more families than were served just one year ago in January 2005. In January 2005, we provided food and other forms of assistance to 3,215 individuals from 1,765 families. In January 2006, we provided aid to 3,773 individuals from 2,149 different families. The trend lines are crystal clear. My poor neighbors are not getting better. They are not doing better. They are doing worse with each passing year. And about 1 million new families each year are dropping off into poverty. All the while, my national leaders are pressing to make tax cuts permanent for the wealthiest among us. At the same time, these leaders hack and cut away at our already shredded national "safety net." I see hungry children on a daily basis. I watch humbled adults as they seek assistance to help them make their very meager ends meet. The poverty I observe makes every social challenge more and more intractable. Take your pick: housing, education, employment, health care, transportation, child care. It is a national, urban shame emerging from a tired, threadbare political and economic ideology. Where are the voices of America's people of faith? It is past time for new ideas and a new direction. Just ask my friends down on Haskell Avenue. The city can be very, very lonely. A young girl in our church once explained her pregnancy to me in these terms. "Larry, I needed a baby. I wanted someone to love and I needed someone to love me," she said. She would have no husband and her baby no father, but she was going to have one other person to love in this world. Things are more complicated than our easy, middle class moralisms often allow. Poverty destroys communities from the inside out. Renewing the social capital of neighborhoods and families and the relational fabric that provides people nurture, love and meaningful relationships is the nature of the work we attempt to do in the city. If a person has just one other person who is waiting for his or her return, the world and everything in it can begin to change. My young friend who thought she had to have a baby to find someone to care for and to care for her might have chosen differently if there had been other, authentic alternatives that she could have identified and understood. Our work is about love and building human connections that will sustain life and give us all reason to both wait and to return "home." Dealing with Demons Demands Determined Action! Dr. John Fiedler, Senior Minister at First United Methodist Church--Dallas, delivered a sermon to his congregation Sunday before last about the unfortunate man described in Mark 1:21-28 who was possessed of demons. The sermon can be found for your listening benefit on the church's website at http://www.webcasting.com/fumc/. It was so honest and moving both about the life of his church and his own personal life. He characterized the entire situation with the demon possessed man as a tragic "family secret." As I took in his message, I thought about confronting evil in our city, on its streets. The demons of poverty, oppression and injustice certainly are forces that plague us, they are forces to be reckoned with every bit as much as personal expressions of evil. So, how does one "cast out" a demon? Well first, you have to face it, identify it for what it is and determine to deal with it! The worst thing in the world to do with a demon is to deny that it exists. We are experts at denial, aren't we? What is true in our personal lives, is often the case in community life. Failure to face the truth about our life as a city, as a neighborhood can be deadly. Once we face the truth, identify the reality that causes the pain and hurt; we must take authoritative action. Overcoming evil calls for a kind of boldness, a certainty that emerges from a clear value base--a kind of moral confidence that makes us very uncomfortable these days. But without a word of authority, the demons will remain unmoved. Working in an urban community among the poor calls for clarity of purpose, solid values and confidence of direction. Armed with truth, we can face, call out and deal with the demons surrounding and working among and against the poor. To act with authority calls for an equally authoritative vision. Leadership is key to defeating demons. A city without strong leaders who possess a vision for a "demon free" community will make little or no real progress against the forces that constrain and control people who are poor. The forces of evil as portrayed by the Gospel of Mark had the ability to pull people apart, to hideously contort their bodies, their lives and their souls. The demons we face daily in the city do the same and more. You can just see, feel, touch and smell the work of our very present, urban demons. . .
. . .destroying men, women and children. . .
. . .ripping apart neighborhoods block by block. . .
. . .descending with chronic, epidemic disease sets on individuals and families. . .
. . .entrenching sub-standard housing in reality and in hapless expectation. . .
. . .inspiring the toleration of inferior educational opportunities. . .
. . .locking adults into low-paying jobs. . .
. . .spreading the lethal escapism of drug and alcohol addiction. . .
. . .hooking our "elite" on respectable greed and progressive plans for the benefit of the well-connected few. . .
. . .convincing public policy leaders that "nothing can be done" afterall. . .
. . .removing the poor from community conversation and decision making. . .
. . .sewing despair into the hearts and minds of almost everyone. We need a new "approach." No more and not here! 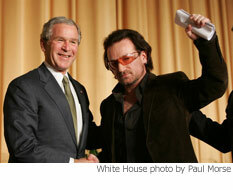 What follows is the complete transcript from the sermon delivered by rock star and leader of the band U2, Bono at this year's National Prayer Breakfast in Washington, DC. You gotta read this one! Yes, it's odd, having a rock star here - but maybe it's odder for me than for you. You see, I avoided religious people most of my life. Maybe it had something to do with having a father who was Protestant and a mother who was Catholic in a country where the line between the two was, quite literally, a battle line. Where the line between church and state was...well, a little blurry, and hard to see. It was what Colin Powell, a five-star general, called the greatest W.M.D. of them all: a tiny little virus called AIDS. And the religious community, in large part, missed it. The ones that didn't miss it could only see it as divine retribution for bad behavior. Even on children...even [though the] fastest growing group of HIV infections were married, faithful women. When churches started demonstrating on debt, governments listened - and acted. When churches starting organizing, petitioning, and even - that most unholy of acts today, God forbid, lobbying...on AIDS and global health, governments listened - and acted. Look, whatever thoughts you have about God, who He is or if He exists, most will agree that if there is a God, He has a special place for the poor. In fact, the poor are where God lives. I mean, God may well be with us in our mansions on the hill. I hope so. He may well be with us as in all manner of controversial stuff. Maybe, maybe not. But the one thing we can all agree, all faiths and ideologies, is that God is with the vulnerable and poor. "If you remove the yoke from your midst, the pointing of the finger and speaking wickedness, and if you give yourself to the hungry and satisfy the desire of the afflicted, then your light will rise in darkness and your gloom with become like midday and the Lord will continually guide you and satisfy your desire in scorched places." 'As you have done it unto the least of these my brethren, you have done it unto me' (Matthew 25:40). As I say, good news to the poor. Here's some good news for the president. After 9/11 we were told America would have no time for the world's poor. America would be taken up with its own problems of safety. And it's true these are dangerous times, but America has not drawn the blinds and double-locked the doors. Because you're good at charity. Americans, like the Irish, are good at it. We like to give, and we give a lot, even those who can't afford it. But justice is a higher standard. Because there's no way we can look at what's happening in Africa and, if we're honest, conclude that deep down, we really accept that Africans are equal to us. Anywhere else in the world, we wouldn't accept it. Look at what happened in South East Asia with the tsunami--150,000 lives lost to that misnomer of all misnomers, "mother nature." In Africa, 150,000 lives are lost every month. A tsunami every month. And it's a completely avoidable catastrophe. It's annoying but justice and equality are mates. Aren't they? Justice always wants to hang out with equality. And equality is a real pain. You know, think of those Jewish sheep-herders going to meet the Pharaoh, mud on their shoes, and the Pharaoh says, "Equal?" A preposterous idea: rich and poor are equal? And they say, "Yeah, 'equal,' that's what it says here in this book. We're all made in the image of God." We hear that call even more powerfully today, as we mourn the loss of Coretta Scott King - mother of a movement for equality, one that changed the world but is only just getting started. These issues are as alive as they ever were; they just change shape and cross the seas. Preventing the poorest of the poor from selling their products while we sing the virtues of the free market...that's a justice issue. Holding children to ransom for the debts of their grandparents...that's a justice issue. Withholding life-saving medicines out of deference to the Office of Patents...that's a justice issue. That's why I say there's the law of the land. And then there is a higher standard. There's the law of the land, and we can hire experts to write them so they benefit us, so the laws say it's OK to protect our agriculture but it's not OK for African farmers to do the same, to earn a living? This is a dangerous idea I've put on the table: my God vs. your God, their God vs. our God...vs. no God. It is very easy, in these times, to see religion as a force for division rather than unity. This is not a Republican idea. It is not a Democratic idea. It is not even, with all due respect, an American idea. Nor it is unique to any one faith. A number of years ago, I met a wise man who changed my life. In countless ways, large and small, I was always seeking the Lord's blessing. I was saying, you know, I have a new song, look after it. I have a family, please look after them. I was amazed when I first got to this country and I learned how much some churchgoers tithe. Up to 10% of the family budget. Well, how does that compare with the federal budget, the budget for the entire American family? How much of that goes to the poorest people in the world? Mr. President, Congress, people of faith, people of America: I want to suggest to you today that you see the flow of effective foreign assistance as tithing.... Which, to be truly meaningful, will mean an additional 1% of the federal budget tithed to the poor. 1% is the girl in Africa who gets to go to school, thanks to you. 1% is the AIDS patient who gets her medicine, thanks to you. 1% is the African entrepreneur who can start a small family business thanks to you. 1% is not redecorating presidential palaces or money flowing down a rat hole. This 1% is digging waterholes to provide clean water. America gives less than 1% now. We're asking for an extra 1% to change the world--to transform millions of lives - but not just that and I say this to the military men now - to transform the way that they see us. 1% is national security, enlightened economic self-interest, and a better, safer world rolled into one. Sounds to me that in this town of deals and compromises, 1% is the best bargain around. These goals - clean water for all; school for every child; medicine for the afflicted, an end to extreme and senseless poverty - these are not just any goals; they are the Millennium Development goals, which this country supports. And they are more than that. They are the Beatitudes for a globalised world. I don't have to sit on any budget committees. And I certainly don't have to sit where you do, Mr. President. I don't have to make the tough choices. To give 1% more is right. "I don't believe in charity. I believe in solidarity. Charity is so vertical. It goes from the top to the bottom. Solidarity is horizontal. It respects the other person and learns from the other. I have a lot to learn from other people." I expect that there is a time and a place for acts of charity. Stories of Good Samaritans touch us deeply. But, even these moving examples of human kindness may need to be "reframed" in our minds and our hearts if we are to be used in the creation of a new community. What if the Good Samaritan of Jesus' tale looked at his acts of kindness in quite a different manner than we normally do or even consider doing? Imagine for a moment that he regarded his actions as investments in his neighbor. What if he was thinking not only of the beaten man's wounded body, but also about his abandoned family, his neglected business, his future and the impact of the remainder of his life on the good of the entire community and nation? If you read the story, you will notice that Jesus does not commend the Samaritan for his charitable action. Rather, he holds him up as a model neighbor. That image changes things a bit, doesn't it? Do you consider kindness done toward the person next door to be charity? Or, do you see it as the natural thing to do with and for someone who is important, not only to you, but also to many others? Often in this space people decry the engagement of public institutions in providing collective solutions or remedies to pressing human, social problems. Many people seem to resent the government "forcing" them to provide for the weak. Somehow freewill charity feels better to many of us. That way we can maintain control of our assets and of our decisions. I suspect that we might adopt a completely different view if we could come to regard these provisions not as charity, but as investments in the lives of the persons who receive the benefit--investements every bit as important and even more so to the community as are infrastructure improvements, economic development or national defense. Every dollar flowing to educate the children of a ghetto neighborhood in South Dallas benefits not only those low-income students, but also my children and my grandchildren. Every dollar set aside to improve community health among the poor benefits business, schools, churches and even individuals who can afford health insurance today. Every dollar directed to the development of high-quality, affordable housing is a dollar invested in the regional economy that serves everyone. Why do we so readily concede that dollars directed to the benefit of the wealthy return a greater yield and assume more importance than funds invested at the bottom? Why are these "bottom rung" expenditures considered charity, while those benefits that flow so easily toward the top are seen automatically as sound investments? Our problem has to do with how we regard our neighbors. Our challenge is to see that everyone is worth our investment. Yesterday, as expected, the U. S. House of Representatives approved the budget reconciliation bill by a vote of 216-214. Citizens concerned for their low-income neighbors lobbyed hard against the bill's passage, and actually narrowed the final gap by a few votes. But in the end, poor Americans lost another round with the Congress. The bill insures that an additional $40 billion will be cut over the next 5 years from efforts designed to lift the poor. The impact of the bill on the deficit is likely to be negligible, slicing less than one-half of 1 percent from the estimated $14.3 trillion in federal spending over the next five years. At the same time, the budget plan will adversely impact millions of Americans at the bottom of our increasingly divided economy. Among those most affected will be low-income working mothers, Medicaid recepients, the disabled, children, women seeking child support payments from absent fathers and students who need loans to continue their education beyond high school. Thirteen moderate Republicans teamed with 200 Democrats and one independent to vote against the bill. "In recent days, separate Congressional Budget Office documents estimated that Medicaid changes would impose new costs on 13 million poor recipients and end insurance coverage for 65,000 Medicaid enrollees, that cuts to federal child-support enforcement funds would shift costs to the states and eliminate billions of dollars in child-support payments, and that changes made to the Senate-passed budget package saved private Medicare insurers $22 billion over 10 years." Congress will soon decide on whether to make permanent recent tax cuts and to extend additional tax cuts to the wealthiest Americans. The tax cuts will cost at least $60 billion over fives years, more than wiping out the savings achieved in the budget bill just approved. I think of so many of my friends as I consider this latest example of our nation's slide away from compassion and justice in public policy development. It is ironic, is it not, for a nation so consumed and concerned with matters of faith and values to turn the economic screws tighter on the lives of the weakest, the oldest, the youngest and the most vulnerable in our nation? I also think of the Hebrew prophet Isaiah. Chapter 10's first four verses come to mind immediately. Thanks to the action of advocates for the poor from all across the nation and to a few procedural manuveurs by some members of the U. S. Senate, the final federal budget reconciliation bill that combines the House and Senate versions of spending plans for 2006 and beyond has not been passed as yet. A vote is set for today, Wednesday, February 1. A bit more background on the delay may be helpful. Both the House and Senate passed different versions of the budget reconciliation bill. Before the holidays, members of the House and Senate were in negotiations to iron out the differences in the bills, so that members could vote on a compromise. The House passed the compromise legislation. But when it became clear that the bill was going to pass the Senate, a number of Senators, concerned about how the cuts targeted low-income Americans, were able to force small changes to the bill. This Senate action made it necessary for the bill to be voted on again by the House. This gives people who care about low income families one more chance to express their opinions on this important bill. To do so simply call your U. S. Representative in the House on Wednesday--it would be best to call early in the day, but call anytime you can. An easy way to take action is to call the Capitol Operator at 888.818.6641 and ask for your Representative. The bill would cut nearly $40 billion in mandatory programs, including Medicaid, SSI and TANF--all efforts to assist and to lift the poor in our nation. The bill would cut housing preservation upfront grants that assist developers of affordable housing preserve HUD-assisted housing and to do their work in low-income communities. The bill would cut funds for efforts to insure that child support payments are enforced-- $8.4 billion in child support will go uncollected over 10 years. Because of a $4.9 billion cut over 10 years for child support enforcement activities, children and families owed child support from an absent parent will go without $8.4 billion. Child support lifts children out of poverty. Families receiving child support with incomes between 100 – 200 percent of the federal poverty line averaged $4,000 in support payments in 2001 – 15 percent of their income. When enforcement dollars are reduced, less support is collected. In short and in summary, the bill hurts the weakest among us while providing more tax cuts to those who are the strongest. Keep reading if you want more detail! The Congressional Budget Office has estimated that over the next ten years Medicaid will receive $42 billion less than the cost of continuing to provide the current level of services, not counting new funds for such separate items as helping states to care for Katrina evacuees. The Census Bureau projects that the U.S. population will increase by 9.5 percent from 2000 to 2010, with a growth of 14.8 percent among people over 65 during the same period. It stands to reason that Medicaid expenditures will have to rise simply because the population is growing, and disproportionately among those who need more medical care. Population growth pushes up the cost of other services, too. This budget bill specifically changes the law to reduce services and benefits, deny eligibility, and/or increase costs beyond people’s ability to pay. Members of Congress who trumpet that they’ve slowed the rate of growth in Medicaid, for example, don’t want to tell you that they’ve done it through changes that will result in less medical care for millions of low-income children, families, and the elderly. The bill changes the law to allow states to charge many low-income people more for medical services. For a similar earlier version of the bill, the Congressional Budget Office estimated that 80 percent of the reductions in federal spending due to higher patient fees will be achieved because people will go without care. That’s the kind of cut this budget bill is full of – people in need going without services. For working-poor parents and other Medicaid beneficiaries, states will be able to scale back medical coverage. In addition, virtually all of the 28 million children served by Medicaid may lose access to the comprehensive health coverage they now receive. Fewer low-income elderly people will be eligible for long-term care. The agreement now back before the House requires all those applying or reapplying for Medicaid to show a passport or birth certificate as proof of citizenship. Those of us who work among the poor in urban settings know what a nightmare this requirement will be for countless persons. Who will have the most trouble providing such documents? People who have lost important papers in the recent hurricanes or other disasters, people who are mentally ill or homeless, older African-Americans (one study estimated as many as one in five African-Americans born before 1940 lacks a birth certificate), and people with language barriers. The poor. Replacing birth certificates takes time and money. Less care for the neediest people. College students will have to pay more for their student loans. The bill cuts federal spending on student loans by a net $12.7 billion, forcing interest rates up for student loans. The federal government gets 70 percent of the bill’s gross savings from raising the interest paid by students or their families above current rates and then capturing the overpayments back from the lenders. Students will pay more, though even now more than 39 percent of college students graduate with unmanageable debt. Approving applications for cash aid for poor people with disabilities can take many months, even years. When benefits are approved, people now get lump sum payments for the time in which the application was pending. This bill makes beneficiaries wait much longer to collect what they are owed even after a court has ruled in their favor. people will die before they receive their full benefits--sort of a "death tax" on poor people with disabilities. One Dallas area member of the House is arguing in letters to his constituents who are questioning the wisdom of this bill that it is "immoral" to pass along huge deficits to our children and grandchildren. If he believes this, how could he possibly support a tax cut that will add to the very deficit he considers immoral? Leaving people in a position to experience ill-health, limited housing and education options and wages that are impossible to live on, these are issues of morality. Caring for all of our children, our elderly and our disabled NOW is an act of great moral courage and commitment, or it least it seems that way to me. But, the fact is, soon after people lose needed help, tax cuts providing billions of dollars to the wealthy will dig the deficit hole deeper – that is, unless better sense does not prevail. And yes, we should always do what we can to make sensible savings. The Senate tried to reduce expenditures through lower Medicaid payments for prescription drugs and through savings in the Medicare program, both of which would have avoided losses experienced directly by low-income people. These alternatives were rejected. Despite all the denials and the oft-repeated talking points, this budget bill makes billions of dollars in cuts that hurt children, students, people with disabilities, low-income families, and the elderly. These cuts are being made to pay some of the billions sought for more tax breaks. Call your Representative and express your opinion.